Dosimeter-radiometer MKS-05. Gamma and X-ray radiation equivalent dose rate: 0.1 ... 9999 µSv/h. Gamma and X-ray radiation equivalent dose: 0.001 ... 9 999 mSv. Beta - particles flux density: 10 ... 100 000 1/(cm2·min). Energy range: 0.05 ... 3.0 MeV. Time of continuous operation with fresh power cell: 2000 hours. Operating temperature range: -20 ... +50 C. Weight: 0.15 kg. Dimensions: 120 x 52 x 26 mm. Dosimeter Terra-P is aimed for domestic usage. Perfectly suits for radiation measuring in everyday life. Helps you to control radiation during you leisure time, at home, in the office, in your car, own house-building. Controls contamination with beta-particles of your clothes, food, berries and mushrooms. It is recommended for educational purposes at schools and universities. Weight 0.2 kg, dimensions: 55x26x120 mm. Gamma-beta radiation radiometer- dosimeter RKS-01. Gamma and X-ray radiation equivalent dose rate: 0.1...999.9 µSv/h. Beta-particles flux density: 10 ...100 000 1/(cm2·min). Energy range: 0.05 ... 3.0 MeV. Time intervals of measurement 1...70 s. Time of continuous operation with fresh power cell: 2500 hours. Operating temperature range: -20...+50 C. Weight: 0.35 kg. Dimensions: 220x80x35 mm. Gamma-beta radiation radiometer- dosimeter RKS-01. Gamma and X-ray radiation equivalent dose rate: 0.1...999.9 µSv/h. Beta-particles flux density: 5 ...100 000 1/(cm2·min). Energy range: 0.05 ... 3.0 MeV. Time intervals of measurement 1...20 s. Time of continuous operation with fresh power cell: 2500 hours. Operating temperature range: -20...+50 C. Weight: 0.35 kg. Dimensions: 220x80x35 mm. Personal gamma radiation dosimeter DKG-21. Gamma and X-ray radiation equivalent dose rate µSv/h, 0.1…1 000 000; Gamma radiation equivalent dose, 0.001…9 999 mSv. Infrared port with 38 400 bit/s. Time of continuous operation with new lithium battery (CR2450) - 2 200 h. Weight 0.08 kg. Dimensions, mm 86x54x9. Search gamma-beta radiation dosimeter-radiometer MKS-07. Gamma and X-ray radiation equivalent dose rate: 0.1 µSv/h ... 2.0 Sv/h. Radiation equivalent dose: 1.0 µSv ... 9999 mSv. Beta -particles flux density: 5...100 000 1/(cm2·min). Operation time: 100 hours. Temperature range: -25...+55 C. Weight: 4.2 kg. Dimensions: 445x255x85 mm. Multipurpose dosimeter-radiometer for fire departments. 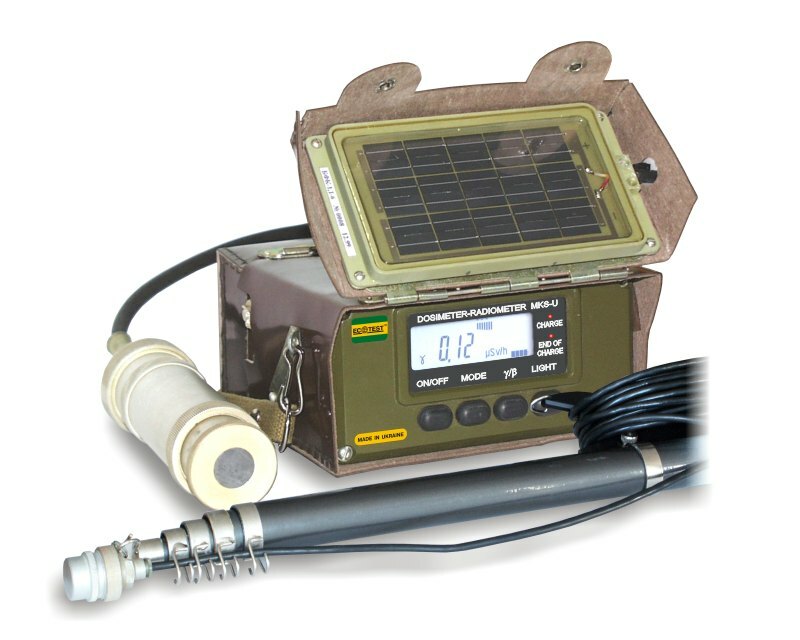 Measurement of emergency levels of gamma radiation in the range 0.01…100 Sv/h by placing the external detector at a distance of up to 30 m (in case of additional emergency detector of gamma radiation). Automatic setting of measurement intervals and ranges. Multipurpose dosimeter- radiometer (modernized roentgenometer DP-5V). Range of measurement of equivalent dose rate: 0.1...100000 µSv/h (with external detector: 0.01...100 Sv/h). Gamma and X-ray radiation equivalent dose: 0.001 ... 9 999 mSv. Beta- particles flux density: 10 ... 200 000 1/(cm2·min). Personal gamma radiation dosimeter DKS-02P with search function for control of unsanctioned transference of radioactive materials and search for radiation sources. Gamma and X-ray radiation equivalent dose rate (137Cs): 0.05…300.0; ±15% (µSv/h); Energy range of registered gamma and X-ray radiation and energy response, (MeV): 0.05…3.0; ±25%. Measurement of ambient equivalent dose rate (hereinafter – EDR) of gamma radiation. Ambient equivalent dose rate of gamma radiation 0.1 μSv/h ... 10.0 Sv/h, up to 100.0 Sv/h on request. Energy range of gamma radiation, MeV 0.05 ... 3.00. Can be used both within informational indicator panels and automated systems of radiation monitoring, RS-485. 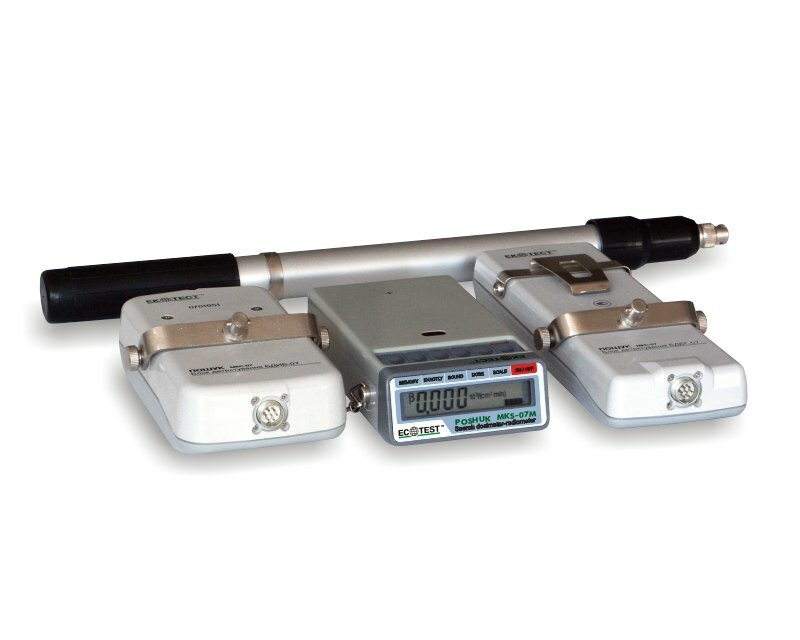 It is a compact, general purpose survey meters capable of detecting alpha, beta, gamma, and x-rays over 3 selectable ranges. A red count light flashes and audible beep sounds with rising radiation levels. Accuracy: +/- 10% of full scale. Operating Range: 0-0.5, 0-5, 0-50 mR/hr and 0-500, 0-5,000, 0-50,000 CPM. Weight: 178 g, size: 145 x 72 x 38mm. Temperature Range: -20 C to 55 C.
Detect Beta radiation, and X-ray and Gamma rays. Designed for evaluation of ambient dosage of gamma-radiation, which can be done by common people in domestic environments (food products, construction materials, soil, etc.). Also, the instrument can be used by personnel working with ionizing sources of radiation. Instrument can detect objects polluted by beta-active radioactive nuclides. Images SI Inc.'s Analog Meter Geiger Counters are useful for detecting and measuring radioactivity and performing nuclear experiments. The analog meter is calibrated in mR/hr that is useful for approximating radiation levels of 0-10 mR/hr and 0-20 mR/hr. It detects the following radiation: Alpha above 3.0 MeV; Beta above 50 KeV; Gamma above 7 Ke. Includes: digital output jack. The analog meter is calibrated in mR/hr that is useful for approximating radiation levels of 0-10 mR/hr and 0-20 mR/hr. The GCA-03W Geiger Counters have the following features: headphone jack and digital output jack. The digital output may be interfaced to a PC or a microprocessor. It detects: Alpha above 3.0 MeV, Beta above 50 KeV and Gamma above 7 KeV. Digital Geiger Counters are useful for detecting and measuring radioactivity. The model GCA-04 has an internal geiger mueller tube. It detects the following types of radiation: Alpha above 3.0 MeV; Beta above 50 KeV; Gamma above 7 KeV. RS-232 output for PC. Resolution and Range 1 Count Per Minute (CPM) - 9,360 Counts Per Second (CPS). Software included. GCA-04W are useful for detecting and measuring radioactivity. Detector sensitivity: Alpha above 3.0 MeV; Beta above 50 KeV; Gamma above 7 KeV. Resolution and range: 1 count per minute (CPM) - 9,360 counts per second (CPS). Radiation resolution and range 1 uR/hr - 655 mR/hr; METRIC scale .01 uSv/hr - 6.5 mSv/hr. LCD 16 characters by 2 lines with backlight. Analog Geiger Counters are useful for detecting radioactivity and performing nuclear experiments. The model GCK-02A is an assembled and tested kit. It has an internal Geiger-Mueller tube. The tube is a Ne + Halogen filled, with a .38 effective diameter 1.5-2.0 mg/cm2 mica end window. It detects the following radiation: Alpha above 3.0 MeV; Beta above 50 KeV; Gamma above 7 KeV. In stock. Immediate shipping, no waiting. Continuous radiation monitoring. Tested and approved. Mil spec durability. Everything you need is in the box. All geiger counters have been sold out across the country. There are none to be had anywhere at any price. Everyone is on backorder. Comes with brand new Duracell batteries. Reasonable price. The Extech 480823 EMF/ELF meter allows you to measure electromagnetic field radiation levels from fans, electrical appliances, wiring, and power lines. With a large 1/2" LCD display and a sampling time of 2.5 times per second, you can be assured of easy and accurate measurements. Readings available in both milligauss or micro Tesla. Battery included. An important special feature of the SOR Line is its ability to meet the needs of various applications with one product. Given its multi-detector architecture the measurement range covered is broad, and includes high level gamma and neutron dose rates as well as low level radiations (L.L.R). These dosimeters are qualified in accordance with current military and civil standards. The SOR line has even exceeded some of the standards currently in effect in order to account for harsh operational environments. With over three decades of air monitoring experience, Universal Detection Technology (UNDT) continues to be a leading supplier of detection technologies for biological, chemical, and radiological weapons. The SOR dosimeter line is built upon two basic versions: the SOR/T for tactical (gamma and neutron) and residual/ambient gamma measurements and the SOR/R for residual/ambient gamma measurements. The SOR/T (tactical version) dosimeter has been selected by most NATO countries. As the threat of bioterrorism increases worldwide, Universal Detection Technology is committed to providing the latest research and development that improves early-warning monitoring technologies and counter-terrorism training programs to protect people from bioterrorism and other infectious health threats. The SOR/RF Electronic Dosimeter represents a substantially increased EMI resistance over the SOR-R and SOR-T product lines. It has been enhanced to exceed the EMI interference requirements of MIL STD-461/810. The PDS-100G and PDS-100GN are the new generation of gamma and gamma/neutron radiation detectors. These sensitive pocket-sized devices are designed to detect, locate and quantify any radioactive materials as Special Nuclear Materials or as Radiological Dispersal Devices (RDD), in a very short time. The PDS-100G and GN feature the capability to transmit the measurement and the spectrum on request. High sensitivity and fast response time, wireless communication interface. Visual, audio and vibration alarms. 1999 - 2016 Copyright ©, International Frequency Sensor Association (IFSA). All Rights Reserved.